One set of my kids grandparents live on a farm. Any time we are visiting if we ever can’t find my son it is because he is on the tractor. He is all about anything with wheels especially big vehicles like tractors. 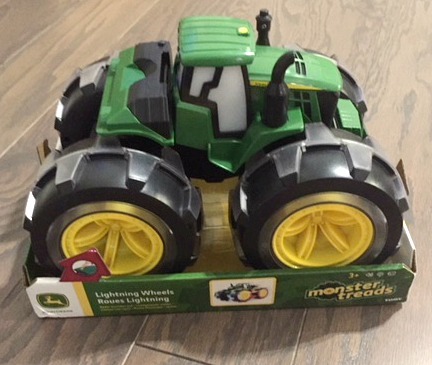 That is why I knew I needed to get him the Lightning Wheels John Deere tractor from Tomy. *I received the below product in exchange for my honest opinion. 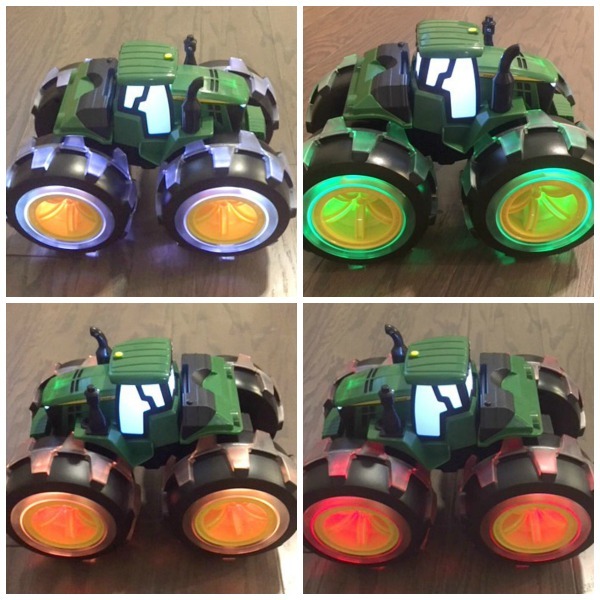 This is the John Deere Monster Treads Deluxe Lightning Wheels from Tomy. This tractor is full of surprises. I brought it out from our Christmas stash to take pictures and right away my husband said “he is going to love that”. Then we put in four AA batteries and turned it on (by pressing the yellow button on the top) and we really knew he would love it. The tractor lights up and makes sounds. Depending on the direction the tractor is moving (it does not move on its own, you need to push it) it will make different sounds. It beeps when it is going backwards and when it is turned on it makes a gurgling engine sound (just like a tractor). It sounds just like a tractor. One thing it has that is different from a real tractor is it’s wheels. Depending on it’s speed and direction they turn different colors. The wheels were blue when it was moving forward. They were green when it was standing still. Then they were orange as it was slowing down. Finally they turned red when it had come to a stop after moving. These many colors would make this a fun toy to play with during the day and during the night (when the lights are out)! Both my husband and I thought this product was a lot of fun and cannot wait to see our son’s face when he opens it Christmas morning. We highly recommend it to anyone else who is looking to buy gifts for a tractor loving child. Who do you know who would love this toy? What would their favorite feature of the tractor be? Let us know in the comments below!